Good or bad news for Microsoft? Steve Ballmer is out of the game. The Microsoft CEO announced today that he'll be stepping down in the next 12 months, which as you might have guessed, is kind of a big deal. We all have different ideas of what this move could mean for Microsoft, and who should lead the company through the next era. So the TechRadar team have pulled together their thoughts in one convenient place for you to pore over. I think you'd be hard pushed to find someone in the tech world who felt that Steve Ballmer was the best man to make Microsoft great again, so his retirement represents a truly huge opportunity for the company. Microsoft is still jam-packed with talent and innovators, it's cash-rich and one of the most trusted brands in the world. It's unlikely that we'll see Gates making a return, but there's a desperate need for someone who will put innovation and excellence at the top of the priority list. CEOs are a strange breed. They're bold and brash, and they live and breathe their brands, for which I admire and slightly hate them. I've got a bit of a soft spot for Ballmer though - he's got that weird, slightly squeaky voice which doesn't go with his face and I find that quite endearing. He's been in charge for some okay stuff at the 'soft too - Windows Phone is quite good, giving devices a bash is pretty brave and I admire the company's ceaseless dedication to trying to get people to use Bing. But it's not quite there, is it? It's not quite cool, not quite exciting enough, not quite top of the tree. Ballmer was, let's face it, a bit old school. Microsoft needs someone a bit more now, I reckon. A bit more Bing. So we'll be waving bye bye to big Steve Ballmer within the next 12 months and surely that can only be a good thing? 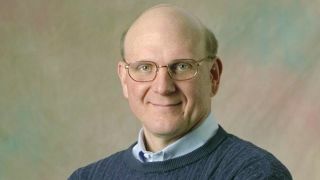 The man had some big views, an energetic - and rather sweaty - stage presence and he wasn't afraid of taking a gamble, but Ballmer never really endeared himself to the world and his position of CEO has been questioned on numerous occasions. He was, of course, dubbed the "world's worst CEO" last year - so the only way is up for Microsoft really. My prediction: This time next year we'll all have a Windows Phone and the Xbox One will be using Kinect to scan our bodies for medical conditions. I like Steve Ballmer, I think he's good. Yes, okay, Microsoft has been very hit and miss in the last few years but I'd rather see a massive, sweaty Ballmer rampaging around on stage than a regular suit. I can't see Microsoft hiring a young Zuck-a-like maverick CEO to replace him - Microsoft is all about slow and steady and that works just fine for a company which makes millions of Windows dollars every day without having to do anything interesting.